Melbourne, Sydney’s artistic sister, is famous for its lanes, alleyways, arcades and cafe society. Walking through its hipster streets is an attraction not to be missed. These streets move to a rhythm all their own. There’s a new revelation waiting to be discovered round every corner. 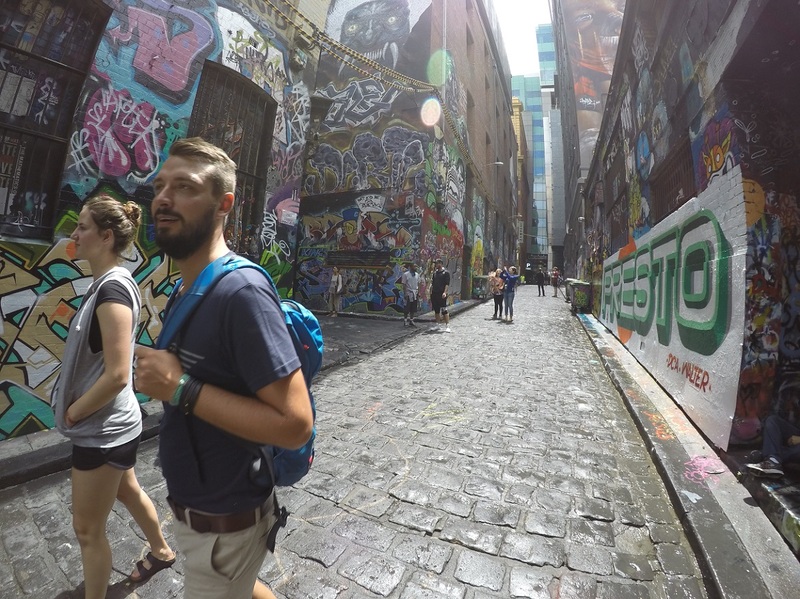 Below is my guide to Melbourne’s must see arcades, lanes and street art. 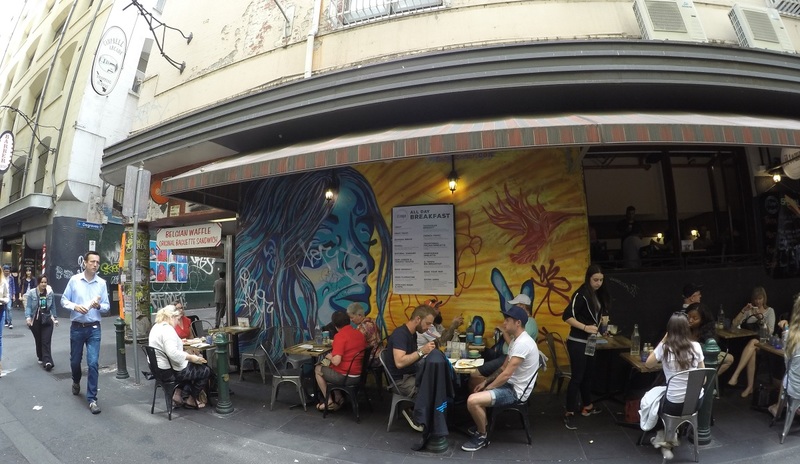 Melbourne is filled to the brim with small beautiful cafes and restaurants, yet its famous lanes standout. They’re tiny streets lined on both sides with hole-in-the-wall shops. 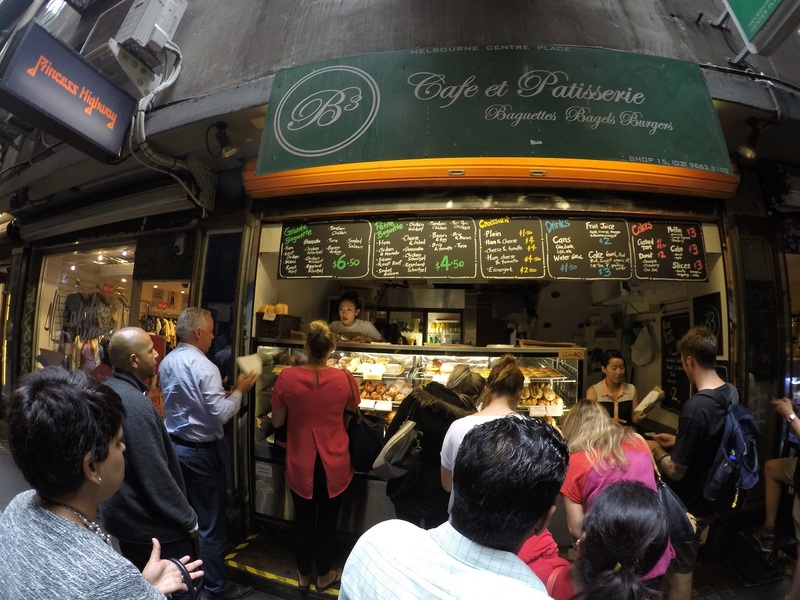 These lanes are buzzing with the caffeinated energy of people drinking and having a quick bite to eat, as a constant stream of tourists pass through these narrow streets hurriedly taking pictures. Center Place: This is the most famous lane in Melbourne that’s probably photographed a million times a day. Even though it gets congested during peak hours, it’s a must see for anyone who visits. Famous places to eat on this street include: ShandDong Mama Mini, The Soup Place and my personal favorite B3 which serves baguettes, bagels and burgers. B3 Cafe et Patisserie serving Baguettes, Bagels and Burgers. Hardware Lane: The street here is paved with bricks and is lined with excellent restaurants serving everything from Italian to Mexican to seafood. Just be prepared for some hard selling from the local establishments trying to pull people in. At night it has a great ambiance, with live music playing. Degraves Street: This is not actually a lane, but what’s in a name? I decided to include it in the list because this street has an excellent vibe and is the perfect place to grab something to eat. It also has two great sweet shops that have become my new guilty pleasures. If you pass by this lane make sure to stop by “Little cupcake” that serves the tastiest and cutest little cupcakes I’ve ever seen and “Choca Mama” which it filled with mouthwatering confectionery. Hosier & Rutledge Lanes: Hosier lane and its attached Rutledge lane are a feast of color, ideas and energy. The walls are free to be painted on at any time, so the art that’s on display is constantly changing and evolving. Some of the work here will impress while others will make you think “Why did they bother?”. Most people who visit rush through the lane, but it’s worth taking your time and admiring the graffiti. You’ll probably discover smaller impressive pieces most people will miss. 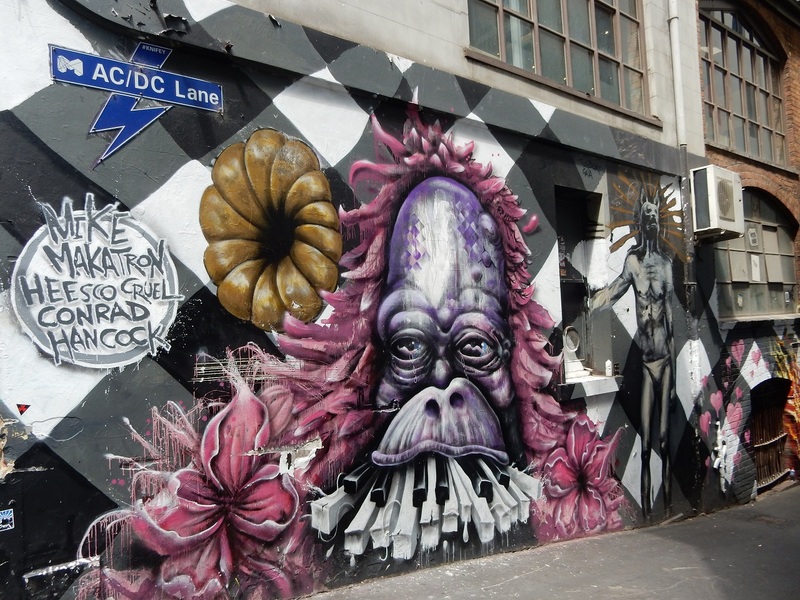 AC/DC Lane: This is my favorite lane in Melbourne. As the name suggests, it’s covered with artwork celebrating the history of the Australian band AC/DC. The most famous drawing is of the band in the iconic schoolboy outfit playing a guitar. My favorite though is of a purple gorilla with piano keys for teeth. Next door, on Duckboard Place, there are original Banksy artwork of rats you can checkout. 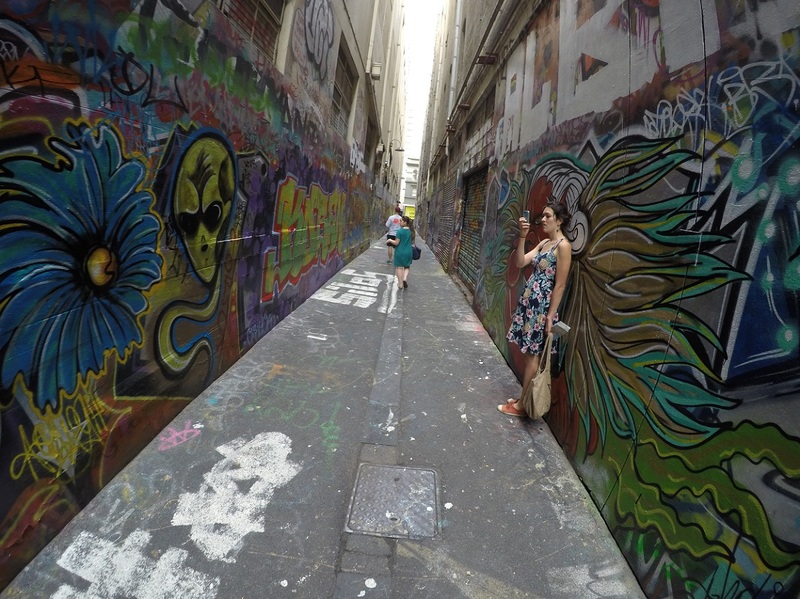 Union Lane: Just like Hosier lane, Union lane is covered from beginning to end with graffiti. This lesser known street is just off Bourke St Mall, you could easily walk right by it without realizing it. Again, when visiting this lane take your time to really check it out and see if you can spot any unique or creative pieces. 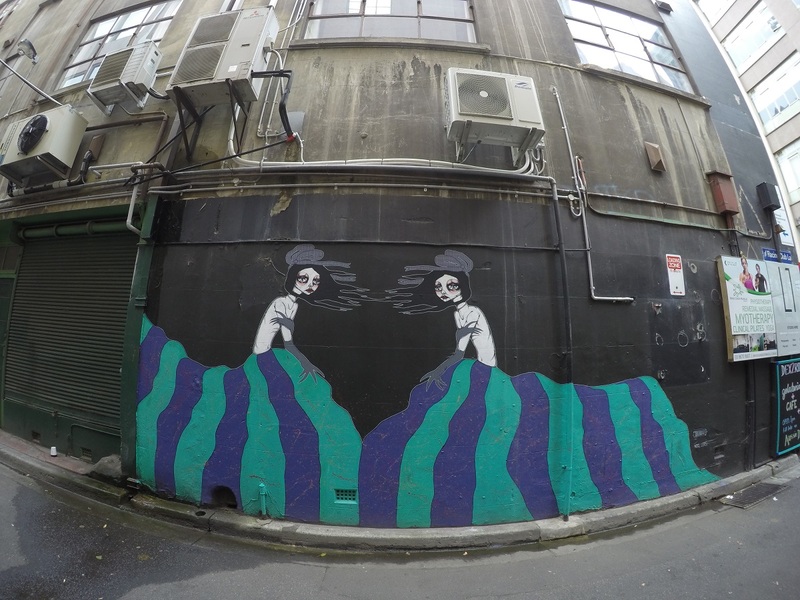 361 Little Bourke Street: Just off Hardware Lane (at 361 Little Burke Street) are some small alleys that contain a couple of really interesting drawings. These are individual pieces (as opposed to whole wall covered with graffiti), but the quality is high. The drawing I particularly liked was of two windswept ladies. 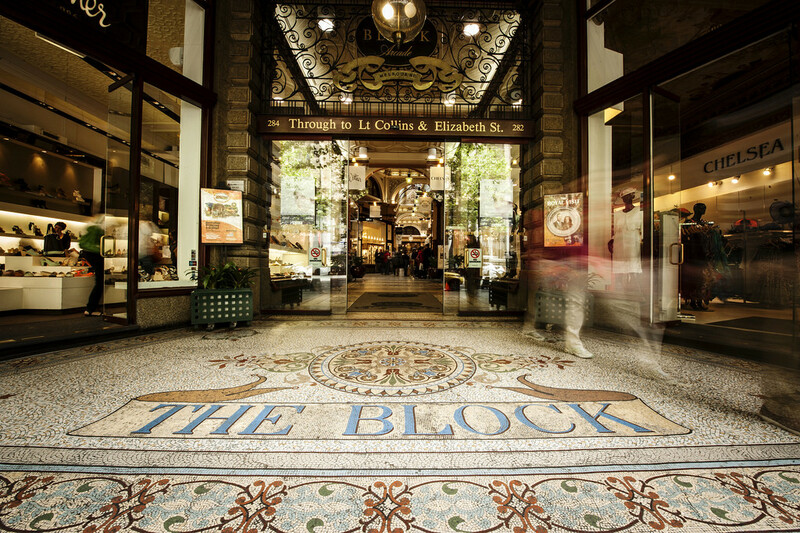 The Block: A beautiful example of 19th century arcade, this building has mosaic tiled flooring, a glass canopy and carved stone. 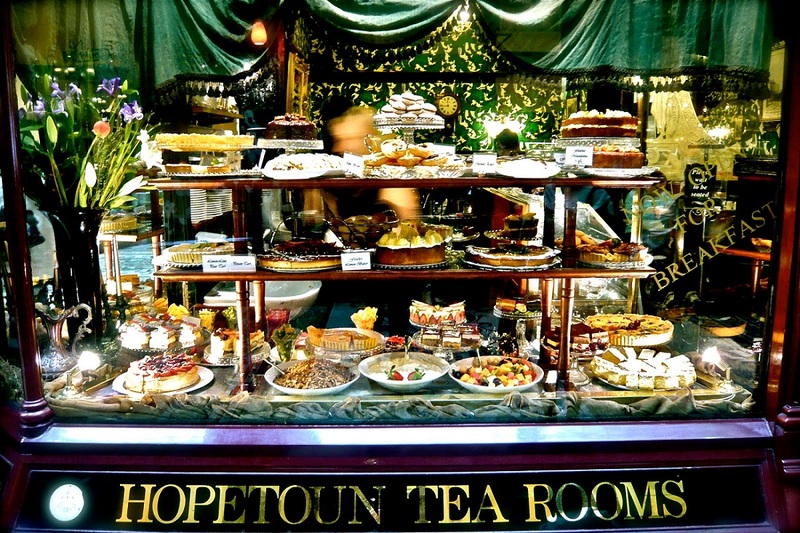 This arcade is also famous for its Tea Rooms whose displays are filled with delicious cakes. 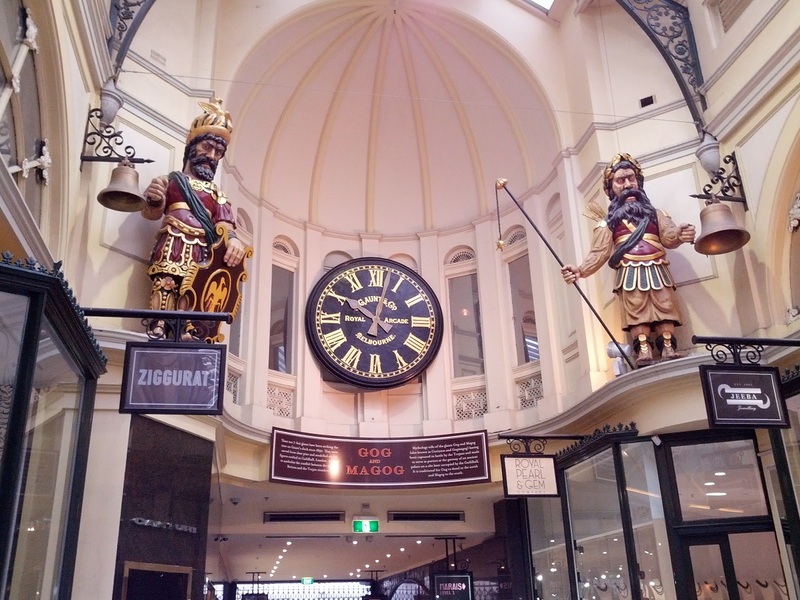 The Royal Arcade: This arcade connecting Bourke Street Mall, Little Collins Street and Elizabeth Street was opened in 1869. The arcade hosts a wonderful selection of stores that include cafes, chocolate shops, jewelry and gift shops. Not to be missed are the two giant statues of Gog and Magog that have struck the hour of Gaunt’s clock on the hour since 1892. Below is timelapsed video I took from my tour of the Arcades and Lanes. Enjoy.